A new report has found that the Coral Sea is one of the most diverse habitats for sharks and tuna. Grey reef shark, Coral Sea. Photo: Getty Images. THE CORAL SEA, OFF Australia's northeast coast is one of the last remaining places brimming with large predatory fish such as sharks and tuna, a study released on Saturday found. The study found the 972,000 sq. km zone stretching from the Great Barrier Reef to the waters of the Solomon Islands and New Caledonia, was home to many unique and endangered species. "The southern edge of the Coral Sea is considered a global biodiversity hotspot for ocean predators such as sharks, tunas and billfish," the Pew Environment Group commissioned report said. 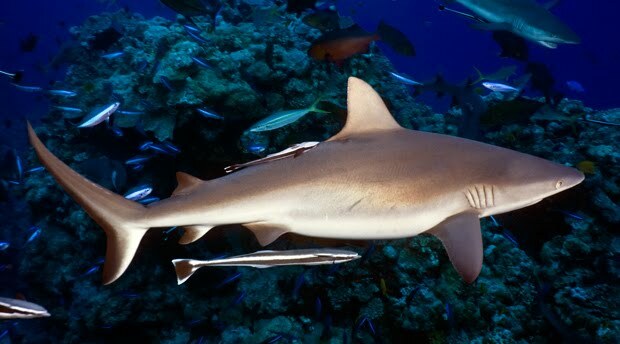 "Oceanic and reef sharks have been documented in large numbers in some parts of the Coral Sea, especially in areas protected from exploitation. Deep-water sharks are known to dwell on the deep continental slopes and plateaux." The report said while only a small part of the area had been intensely studied, available data indicated the sea held important habitats, migration corridors and ecological processes sustaining unique marine life. About 52 species of deep-water sharks, rays and chimaera fish have been recorded in the Coral Sea - 18 of which are endemic to that ecosystem - while it also holds the world's only confirmed spawning aggregation of black marlin. Numerous threatened and migratory whales, turtles and sharks, as well as tuna and billfish, are found in the open sea while cays provided habitat and roosting places for seabirds and nesting spots for endangered green turtles. The southern Coral Sea also has large densities of fish and squid which, as middle-rankers in the food chain, play an important role in regulating food web stability, the report said. In total, some 341 species recognised by the International Union for the Conservation of Nature for their conservation significance are present in the Coral Sea, the study said. The sea also provides migration corridors for species such as humpback whales, loggerhead turtles and freshwater eels - the last of which spawn in the northern Coral Sea and migrate up to 3000km to Australian and New Zealand coastlines. Pew is urging the Australian government to create a permanent conservation marine park in the zone. Protect Our Coral Sea is on Facebook. It's really good to know that there are still such beautiful spots these days. I just hope the authorities will keep these areas from being destroyed. It's Falling Out of Bed Week!